A CALISA RED RECORD BREAKER. Best Toy in Sweepstakes, Best Toy Puppy in Show and Winners Dog at the Greater	Cincinnati PC Specialty - his first time out! Now a Top Producer! We enjoy e-mail!….to keep up with our poodles and their families out in the big world…….but a Calisa Poodle is important enough that first contact protocol demands an initial telephone call. 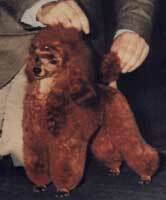 The acquisition of a Calisa Poodle is truly special! Please call us at 941 475-4411. If language or great distance is a barrier, don't let it be! Please fax us at 941 475-2741 to set up a telephone appointment. © 2001-2019 Calisa Poodles. All rights reserved.